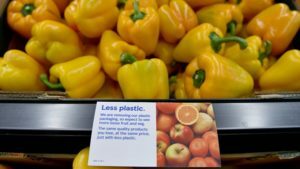 A total of forty-five packaged foods will be taken out of stores and offer apples, mushrooms, peppers, onions, bananas and avocados free from their packaging. Tesco will be surveying shoppers in the stores to understand the reaction to the trial and will monitoring each of the included products to see if there is an increase in food waste. “We want to remove as much plastic as we can from our products, only using what is necessary to protect and preserve our food,” said director of quality Sarah Bradbury. The trial is part of Tesco’s plan to reduce the amount of packaging it uses and to ensure that any remaining plastic has a clear purpose and is recyclable. It is working on a closed loop for its packaging. “Whatever happens, we’re going to keep reducing the amount of packaging we use and ensure everything on our shelves is fully recyclable,” said Bradbury.